Positive outlook for vinyl windows, patio doors, siding. Composite decking market growing. Click on image for the presentation. 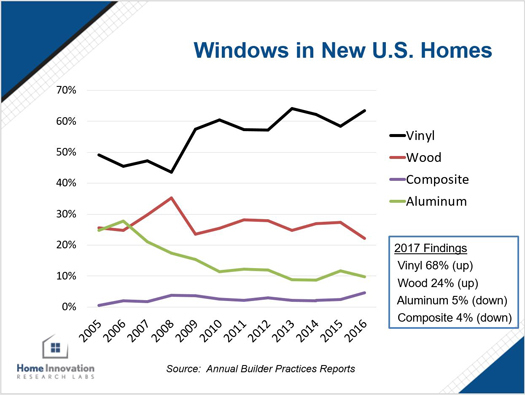 In summary, Ed concludes that the outlook for vinyl windows, patio doors, and siding is very positive. In addition to his encyclopedic knowledge of our decades of survey data, Ed’s prediction is bolstered by current home buying and ownership trends among Millennials, as well as the increasing need for easy-to-install solutions throughout the building industry as we continue to confront skilled labor shortages. Ed also sees and upward trend in the market for composite decking, due largely to the rising price of lumber, chief competitive decking product for composites. Profiles is an annual conference that focuses on plastics profiles for construction applications covering the latest market opportunities, technologies, and applications. This year’s conference examined profile decoration and appearance, material properties, fusion and processability, and provided an update on industry legislations and trends. Ed’s expertise is in high demand – this week, he is presenting more building product and materials trend data at the WDMA Technical & Manufacturing Conference in Minneapolis. If you’re interested in finding out more about the data presented above, purchasing your own survey data reports, or enlisting Ed to present at your industry conference, get in touch.